What about sides? Can't go wrong with cranberry sauce. Learn how to make the perfect sauce below (and don't forget to subscribe to our YouTube page for more tips!). What do chefs make for thanksgiving? Niki Nakayama loves a little mac 'n' cheese! Need some carving help? Let Russ Parsons show you how. Is it too late to dry-brine? Happy (almost) Thanksgiving! 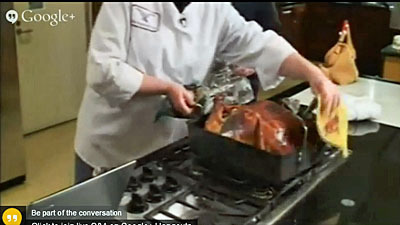 Have you got last minute Thanksgiving cooking, cocktail or entertaining advice? Ask us here and we will answer live! At the Pearl Jam concert this week, @ChefDLeFevre was asked multiple times how to make good gravy. Live chat now! How far in advance can you make mashed potatoes? But Noelle puts it out there: steam/boil potatoes whole, in the skin; refrigerate them, then nuke them. Then make the mashed potatoes. David Lefevre says you can put mashed potatoes in a crock pot an hour ahead of time. How do I know I've added enough chicken stock to my stuffing? I'm using dry bread crumbs (store bought). Oh, snap! Egg nog ice cream on pumpkin pie! Salt your pumpkin pie, Chef David Lefevre says. It will bring out the pumpkin pie flavor and make it less sweet. What do you suggest I add to my stuffing to spice it up? (I was thinking fresh or pickled jalapenos). This turducken just came out of an oven in the test kitchen.